DGL-FF (Fructose Free/Sugarless) / 100 chew tabs - Nature's Way®. 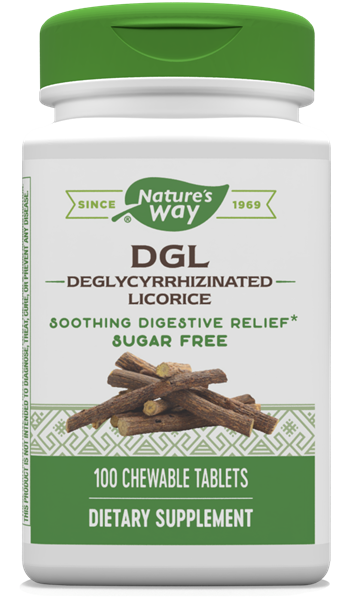 Chewable, sugar free deglycyrrhizinated licorice (DGL) tablet. Contains less than 1% glycyrrhizin to help avoid any potential effect on blood pressure. Chew 3 tablets after food in the morning. Chew 3 tablets after food in the evening. GutGard™ is a registered trademark of Natural Remedies. How does DGL (Sugar Free) work? Great tasting, chewable deglycyrrhizinated licorice (DGL) tablet in Caramel Creme flavor.